Jackson County Parks unveiled its newest RV Park, which opened July 1, 2016, and is called "Southern Oregon RV Park", located in Central Point (I-5, Exit 33), in Oregon's Rogue Valley. 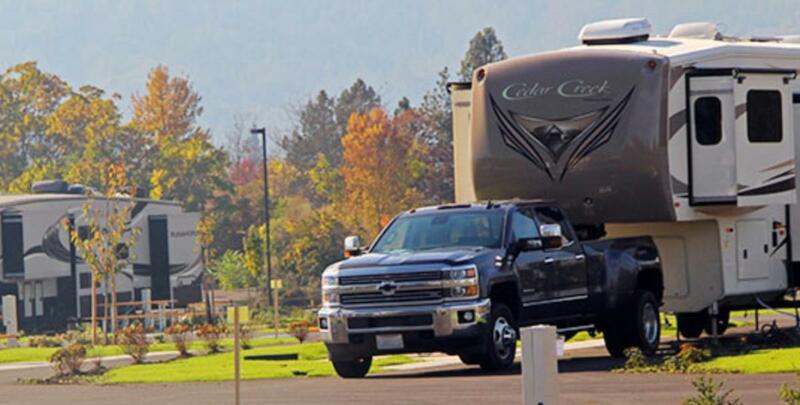 "Southern Oregon RV Park" is OPEN YEAR ROUND and can accommodate larger rigs, with 60' to 75' sites, perfect for the weekender or full-time RV'ers. This newest Jackson County park is nestled between two fishing ponds, teeming with trout, bass, and other warm-water fish. The park offers 92 full-hookup sites, with water, electric, & sewer (NO TENTS ALLOWED), right in the heart of Southern Oregon, in a prime location near various lakes and the Rogue River, and is near ideal locations for outdoor activities such as rafting, boating, fishing, hiking, cycling and camping. The location is also convenient for attending the Shakespeare Festival in Ashland, Oregon, and the Britt Music & Arts Festival in Jacksonville, Oregon. Southern Oregon RV Park also connects directly to the Bear Creek Greenway, a 20-mile, paved, multi-use trail that links the cities of Ashland, Talent, Phoenix, Medford, and Central Point. The RV park features 92 full-hookup sites with water, 20-30-50-amp electrical service, and sewer connections (NO TENTS ALLOWED). All sites are paved with basic sites measuring 60' in length and 12' wide, while premium sites are 75' in length and 15' wide. Each site has a picnic table on a concrete pad and a fire pit for roasting marshmallows. The park has three centrally located restroom buildings with showers as well as an additional restroom in the day-use area of the park. The park also offers a new Park Office/Registration Building, open Monday - Sunday, 10:00 am - 8:30 pm, (541) 423-8115. There is also FREE Wi-Fi throughout the park. Possible future plans for the park include group picnic shelters and accessible fishing docks. Conveniently located on the northern edge of the Jackson County EXPO / Fairgrounds, the Southern Oregon RV Park's close proximity to the EXPO facilities provides a perfect opportunity to camp in a quality RV park and then walk to the Jackson County Fairgrounds for the fair, concerts, rodeos, horse and livestock shows as well as the many other events held at the Expo. Those staying at the park don’t need to worry about parking, where to sleep or where to take a quick break during a busy day at the EXPO as your RV is just a short walk away. So come on out and check out SORV at Exit 33! !